Personally I find the prices to be reasonable considering spare prices of competition from the likes of HMSI especially taking note that TVS's history when it comes to part quality is unparalleled compared to the rest. Do share your thoughts on the same as I'd love to know more about the RR310 from owners as I'm curious to know about part quality in comparison to other members within the RTR family. Good find and thanks for sharing! Pricing seems reasonable overall for wear and tear parts like the chain sprocket set but the brake pads seem to be priced a bit steep. The only worrying part is that in case of a crash, the parts at the front of the vehicle like the headlight assembly, front forks and muffler sub assembly are priced steep. Not in the leagues of the Ninja for sure but for the cost of the bike vs. part price it seems a bit steep. But in case of crash is what insurance is for and they should cover most of these parts if the insurer selected is a good one with clauses to cover fiber parts as well as rubber parts etc. 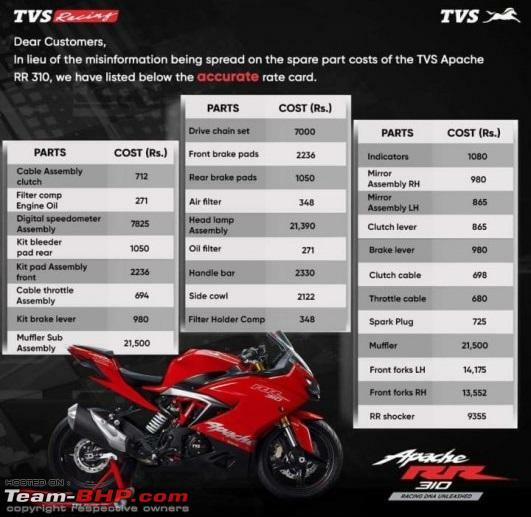 Overall - The TVS is going to be a much more expensive bike to maintain, in comparison to the Bajaj - specially for accident repair. Not sure about the KTMs, which is the more direct competition. Wonder how much of a premium BMW will charge over this now. Last edited by moralfibre : 1st June 2018 at 09:04. Reason: Part pricing trimmed since it's covered in the post above this one. Thanks for sharing, yes the spares seem to be on higher side then expected from a brand like TVS. As clearly pointed a front crash will be bad for your wallet better to keep upgrading with good insurance coverage, just in case. I might be incorrect here, but I don't think the WP branding has anything to do with the chain sprocket kit. Also, even if it is better, is it THAT much better so as to command a price nearly three times higher? This "high quality" chain set also seems to be causing an issue for RR310 owners with the noise problems being reported. Comparing the Duke's spares, I had my front brake pads replaced a few months ago, The set cost me ~INR 1800 as far as I recall. Not sure if the RR310's pads are sintered but the replacements on the Duke were sintered brake pads and they're perfectly good quality pads. These parts definitely seem to command a premium over the rest of the competition. I have not been able to closely observe the quality levels of the RR310, but I believe this is a disproportionate increase in price when compared to improvement in quality. Regardless, I'm not the best judge in this regard and might be proved wrong on a closer inspection of the RR310. I see issues with Apache 310 on all ownership forums, just like the initial days of Duke, I don't see how one can judge a bike's quality even before anyone has covered more than 20K km. KTM's entire bore kit might cost less than Apache's headlight! So KTM's price, quality and spare price are quiet justified. Uncertain if this is some sort of Motorcycle racism I see here but comparing two motorcycles mere on the fact that they're both indigenous doesn't go along with my logic, which is exactly why I find it odd to see everyone comparing the RR310 with the likes of the Dominar/Dukes rather than the Honda CBR 250R/300R, cause a glance at the spec sheet would reveal that the KTM iterations are built for an entirely different purpose with their crazy high 12+:1 compression ratio compared to the RR310's and CBR's balanced compression ratio of sub-11:1. On a different but relate-able note, considering the age old rivals the Pulsar 220 and Karizma, the Karizma's carburetor costs sub-6k whereas the 220's costs sub-3k in spite of the latter having the larger venturi, the reason for the same was simply that the carburetors were from two different vendors and nothing more. And this is the case of motorcycles in the exact same category built for the exact same purpose, so if this wasn't seen to be an issue I don't get why people are skeptical when it comes to the RR310's prices especially when comparing it to a motorcycle built with a completely different intent. Please do educate me if I seem to be missing something. Not even going to KTMs here. But there hasn't been a single incident of Dominar's low quality levers braking into two, while high quality TVS lever has already been on the news for the same reason! Let's just stop assuming quality by the price tag. If you have the data for the CBR 250R, please go ahead and compare it. Should make for a very useful post. This is the best I could find due to the ambiguity present souring Honda spares. It consists of spare prices for the Honda CBR250R for the international market. In an era where things are made of cast, in an era where things are made to almost zero tolerances, in an era where things are made to be used and not re-used, pricing does play a factor. I for one do not believe that quality doesn't always need to come at a cost. But prove me otherwise, on a personal note, paying 750 for a throttle cable, and 700 odd bucks for levers each and 7k for sprockets does not necessarily equate quality, neither is it Manufactured in Germany (on a critics perspective) doesn't justify the price. Cables snap with time, we all know it, some snap faster, some longer. Similarly, take a look at the levers, from the look of it, I PRESUME they aren't forged, but cast, and they aren't even adjustable, when the nearest competitor almost offers a complete package. A drop and boom, your lever just snaps into two, and you pay 700 rupees per side, and that's for a basic dog leg brake lever. Now, from an overall perspective, they may don't seem much, but on a practical level, these do add up on the overall ownership cost. Rest assured, TVS has always been at the forefront of quality, right from their AX 100, Shogun to this day, when compared to Indian manufacturers. But, I stress again, personally I find it a little hard to digest a European three letter brand dissolving the brand's overall affordability. On a positive note, hope they learn the know-how, get more insights into better engineering etc etc and what not. But, I can go on and on. Let me stop at that. Last edited by VijayAnand1 : 4th June 2018 at 21:54. All times are GMT +5.5. The time now is 04:27.